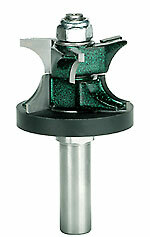 The Burgess Edge is a patented, matched pair of router bits that enables the user to edgeband plywood in a unique and superior edgebanding process. You will need Adobe© Reader© (free software) to read the file. Price: $28.00 (plus shipping)New Product! 1. Capable of handling 5/4” material.2. The carbide on the cutters overlaps to render a continuous, seamless cut.3. The cutters spiral in opposite directions giving the user flexibility to determine which way the cutters are to be stacked to obtain the best result.4. Two different diameter bearings are provided with the bit. This feature gives the bit unprecedented versatility. 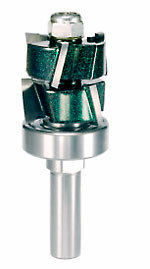 The large diameter bearing is equal in size to the carbide cutters and can be used either on the top of the cutters so the bit functions as a pattern bit duplicating original patterns or on the bottom so the bit functions as a flush cutter for trimming. New Product! The Burgess Edge adjustable bull nose bit makes adding a bull nose edge to 3/4″ material quick and easy. The bit is particularly useful in conjunction with the Burgess Edge edgebanding system, because the extent of bullnose cut is defined exactly by the bearing. First, adjust the upper and lower cutters to the thickness of the material you wish to bullnose by adding or subtracting arbor shims between the cutters. Secondly, clamp a straight edge 3/8″ from your edge or along the veneer of the edgebanded plywood, adjust the height of the router, and form a bullnose effortlessly with no guesswork. Buy the original 3/4″ edgebanding bits ($129) and the adjustable bullnose bit ($59) together and save! The combination price is $160 – a savings of $28. The Burgess Edge 1/2″ Router bits are designed to accomodate the full range of 1/2″ material from veneer plywood to MDF and Melamine. The operate in the same way as the original 3/4″ bits as they are shim able to cover the full range of material from .400″ to .500″. The 1/2″ bits feature an 1/8″ edge rather than a 3/16″ as the 3/4″ do. Therefore, they are particularly useful for curved applications. A bull nose can be added to dress up your drawer sides. They feature a 1/2″ shaft. For the demanding professional who wants to save money and have all options covered, the new combination package includes both the 1/2″ pair of bits and the 3/4″ pair of bits in one handsome box. Both sets of bits come with a full set of shims.